A brilliant and short career in karting led Robert to be immediately competitive in Formula 4. We spoke about his up and coming career and old rivalry. First season in Renault 2.0 was very exciting. It was difficult in the first races because I drove not too many tests before the season started. All other drivers including my teammates had much bigger testing program. They spent huge amount of money for tests and prepared themselves very well. As for me, I was a rookie and had to adapt to the new car throughout the season. Kaufmann is a very good team. To be honest, it is more like family – they have their own unique working style. In the second half of the championship we found our speed and I won a few races. Experience turned into results. 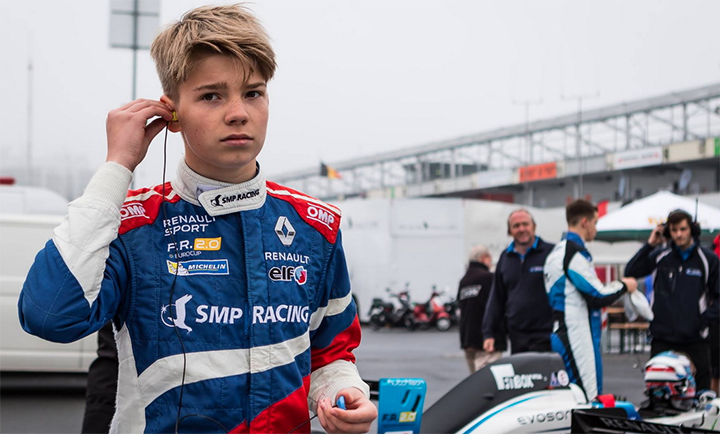 You passed to car racing immediately after the Junior category: how hard is for a young driver to step into a formula so early? If you had the possibility, would you repeat the same move? It wasn’t too hard. Of course, the F.4 car felt very different comparing karting – grip, aero, engine, heavy car – everything was new. You can turn the car with your own body in karting but you can’t do the same in open wheels. I was even surprised when I found out that the formula car can be held only with my arms and feet. I got used to it after few tests and understood everything that I needed for good results. It was the right step for me to go to F4 immediately after KF-Junior category. I would do the same even if I had a chance to do different. I like open wheel racing cars, but one of the most important factors is financing. If everything is okay with the finances, I will get my good results. It’s impossible to come to Formula 1 with a talent only – that door closed right after Verstappen. F.1 has many very talented drivers so you need not just your own speed to get there, but also good financing. You found on your way your old rival Lando Norris, who this year has been simply perfect. How is you relationship with him? Well, sometimes he seemed a bit boastful. But everything is fine – we communicated during the season. He did everything right. He had an opportunity to do many tests and he used it perfectly. I would do the same things in his situation. 2016 is gone, will you race in F. Renault 2.0 also the next year? I will spend another year in Formula Renault 2.0, this time with R-ace GP team. Our minimum target is to get to top-3 of the championship. Better, of course, is to become champions. It will be a very difficult tasks as the field seems to be strong-ever, but we are ready to do our best. What do you think of the career of your old competitors Lorandi, Pulcini and Norris? I took part in GP3 tests at the end of 2016 season. I met Lorandi and Pulcini there. I talked to Pulcini, he was also testing and worked very hard. As for Norris, like I said, he does his job very well and uses every opportunity he has. Are you still following the karting environment? What do you think about OK engines? I don’t really look into karting these days, but I’m happy for my friend Lorenzo Travizanutto. He shows some really good results there. What is your best memory in karting? I have many great memories about Mini class. We had a real “band” there with Sitnikov, Zhirkov, Travisanutto and others. It was very fun, we spent a lot of time together on track and in paddock. We are great friends. Another very good moment is winning WSK Final Cup in KF-Junior category. CIK-FIA World Championship bronze was also a good one but still a bit sorry cause I could have won there. My greatest dream is to win a Formula 1 championship. That’s the main thing. The other dreams may change time after time.